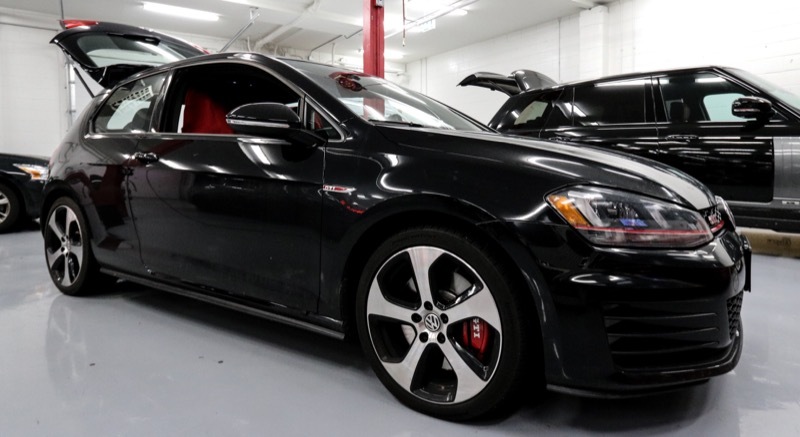 A repeat client of Ralph’s Radio recently dropped into our Vancouver store to talk about upgrading the stereo in his 2015 Volkswagen Golf GTI. We had previously worked on the client’s Honda, and he wanted to transfer some of the equipment from that vehicle into his new car. Luckily, one of our employees also drives a Golf GTI, so we invited the client to audition that system. He liked the way it sounded, so we designed something similar for his vehicle – while keeping his budget in mind. As with every installation the interior protection was our first step. The factory moisture barrier was removed to install the new damping material. We were able to offer the client a great deal on these Focal speakers. The Focal flax speakers were a great compliment to the KRX2 front speakers. The speakers in the rear quarter panels received a Focal speaker upgrade. After putting seat and steering wheel covers in place to protect the interior, the first order of business was to remove the stock speakers from the doors and apply two layers of Cascade Audio VB-2SP damping material. We treated the outside door skins as well as the inner door panel to reduce the possibility of noise transmission into the vehicle. The layer of deadening on the inside door skin also prevents the sound from the back of the speaker from cancelling out the sound from the front. The result is an acoustically optimized mounting location for the new speakers and dramatically reduced background noise while driving. The client had a very specific budget for his Volkswagen stereo system upgrade, and we wanted to maximize every aspect of the system. We had recently purchased a number of the now-discontinued Focal 165 KRX2 component speakers at a greatly reduced price. This deal let us give the customer a great set of speakers while staying within his budget. We mounted woofers from the 6.5-inch component set in the doors using custom mounting adapter plates and located the tweeters behind the factory tweeter grilles in the A-pillars. To round out the sound in the Golf, we installed a set of Focal Flax-Series PS 165FX speakers in the factory locations on either side of the rear seat. The Audison enclosure was test-fit to check the room available for the amplifier mounting. The thin design of the amplifiers and enclosure allowed them to fit under the floor with ease. The space in front of the enclosure was used to mount the crossovers and the amplifiers. Once the factory floor panel is installed, the client still has full use of his hatch space. With the new speakers installed and Audison Connection wiring run into the cargo area of the vehicle, the next step was to mount the system’s amplifier and the passive crossover networks on a panel and complete the wiring. At the heart of the system is a Focal FPX 5.1200 five-channel amp and an FPX 4.800 that run all the speakers and the sub in the vehicle in a fully active configuration. Our technicians tested the frequency response of the factory radio to ensure that it offered a full-bandwidth signal that was free from equalization. After confirming the suitability of the signal, we connected the output of the radio to the system amplifiers using a pair of Audison Connection SLI4 speaker level to RCA line output converters. These modules reduce the audio signal voltage to a level that will work with the RCA inputs on the amplifiers. The client wanted great bass reproduction from the system but also wanted to keep intrusion into the cargo area to a minimum. We suggested using the Audison APBX G7 subwoofer system as a solution. This subwoofer and enclosure are designed to fit under the floor of the trunk in seventh-generation Volkswagen Golf vehicles. The system includes a single 10-inch Prima-series shallow subwoofer and uses a bass-reflex design to increase efficiency while reducing distortion and high drive levels. After reinstalling the door and side trim panels to the vehicle, our technicians set to work on optimizing the crossover and level setting controls on the Focal amps to ensure the system would sound great, image well and play loudly without distortion. The resulting system is not only completely invisible when looking into the vehicle, but it sounds amazing. The subwoofer provides deep and clear bass that blends seamlessly with the new speakers. With the car dialed in, it was time for the client to return to our store and check out his new Volkswagen GTI stereo system. He loved the way it looks and was blown away with how great it sounds. If you are interested in upgrading the audio system in your car or truck, contact Ralph’s Radio in Vancouver or Victoria and speak with one of our product specialists. You can also contact us by e-mail to schedule a personalized consultation.